"You want to stand on your head and you don't even know how to stand on your feet." Then lengthen each foot from the middle of the arch back through your heels. After lengthening the soles of your feet both forward and back, broaden them side to side, even though this may be more of a feeling than a movement. Try to feel your feet widen as much as possible from the centers outward. Maximize the contact of your feet with the floor or sticky mat. Notice that this is not the same as gripping the floor with your feet or toes. Allow your feet to be soft. Lengthening and broadening them does not mean tensing them. Level your pelvis in all three possible planes: front to back (so that your pelvis is neither tipping forward into the "swayback" position nor tipping back and allowing your low back to round), side to side (so that one hip is not higher than the other), and rotationally (so that your hips are square to the front). 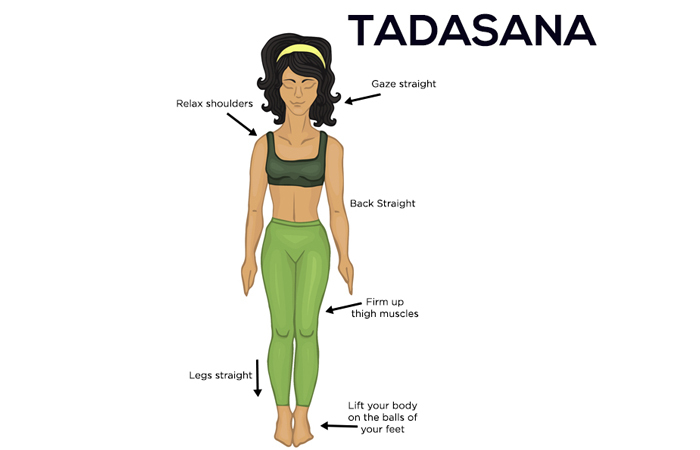 This action is also particularly important in Utthita Hasta Padangusthasana and other standing poses where the extension of the legs in various directions tends to pull the pelvis away from its neutral position. Lengthen both sides of your torso from your hips upward toward your armpits. Feel as though your torso is lifting upward off your hips, out of your pelvis. Lift your side ribs both forward and upward. If you look at a skeleton, you observe that most of your ribcage is in the front of your body. Only the spine belongs to the back of the body. Show that in your posture. Lift your sternum toward the ceiling and expand it side to side. Whenever we lift or open the chest, we actually want to lift the manubrium (bone above the sternum) upward while we lower the xiphoid process (bone below the sternum) downward toward the navel. Draw the skin overlying your front ribs away from your sternum. Broaden your chest and collar bones. Press the skin of your back in toward your sternum to assist these actions. Project your shoulder blades through the front of your chest. Opening your chest is always an action that is done primarily with the muscles of your upper back. However, do not make the common mistake of squeezing your shoulder blades toward each other to open your chest. You must broaden your upper back as much as you broaden your chest and collar bones. We work on lengthening the front of our torso a lot in yoga, especially in forward bends. But in actuality, in almost all poses the goal is to lengthen all sides of the torso, especially including the area from the bottom of the ribs to the tops of the pelvis on the sides of the torso and the lumbar area. Do not neglect these areas. You should not deliberately firm your abdomen, although it does retain a degree of firmness naturally from the uplifting action in your torso. Do not have it soldier-like tensed. (2) you still maintain space between them.